When this time of year rolls around, I can’t help but think of the first time I cooked Thanksgiving dinner. I was 22 and my culinary hero/ superwoman (my mom) had just passed away two months before. All of our family friends wanted to be together as usual which made it over 25 people. Talk about being thrown into the deep end! I remember in the weeks ahead of ‘the big day’, I would stay up late to study recipes, how-to guides and do mathematical equations to find the perfect turkey cooking time. It had to be good- I’m my mother’s daughter after all. In those moments, I wish I would have complained a little less about helping and paid a bit more attention on how she did things. She was amazing. So as the day was upon me, I had most things under control but the only thing that stressed me out was the turkey; it’s the star of the show after all. I remember going to bed around 1am after putting the final touches on the set table and waking up before dawn at 5.30am to prep the turkey. Half asleep, I managed to haul it into the sink so I could get the stuff out of it. I had gloves, tongs and a flashlight for the task – it was like I was ready for a spelunking adventure. I managed to get the neck and other fun ‘bits’ out of the inside but was confused because I could have sworn that each turkey came with a bag of other fun goodies i.e. innards as well. I searched and searched but didn’t find them. I thought they must have forgotten to put them in. So I rinsed the bird (those suckers are slippery and heavy) and dried it. Got my butter mixture up under the skin (being elbow deep in a turkey is not my idea of a good time) and got it into the oven. The rest of the dishes turned out brilliantly but as the time approached to serve the bird, I was nervous – would it be cooked right, would it be too dry, etc. I got it onto its platter and it looked great from the outside so, I began to carve it – publicly. It wasn’t until I got up around the top of the bird, in the neck part to be exact, that I noticed something a little funny. Something that suspiciously looked like a bag. So yeah, that happened. Long story short, the turkey turned out amazing, especially for my first ever go at it and word to the wise – they don’t just ‘forget’ the bag of bits. So with that said, I wanted to share a little easy and fun Thanksgiving DIY decoration to get us all into the season. 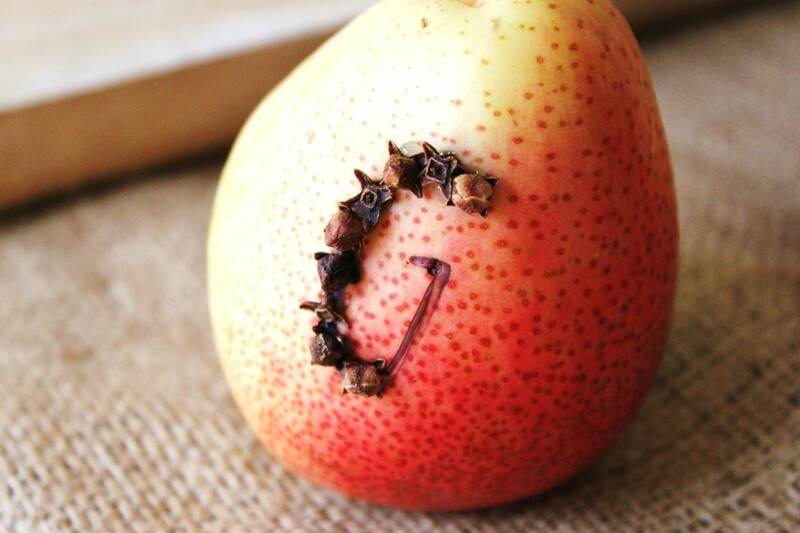 All it takes are a few pears, some whole cloves and some clever wording. Here are the materials – a few Fiorelli Pears. I like these particular pears because they have a bit of red in them and they are small. You could really use any type of pear or even an apple. 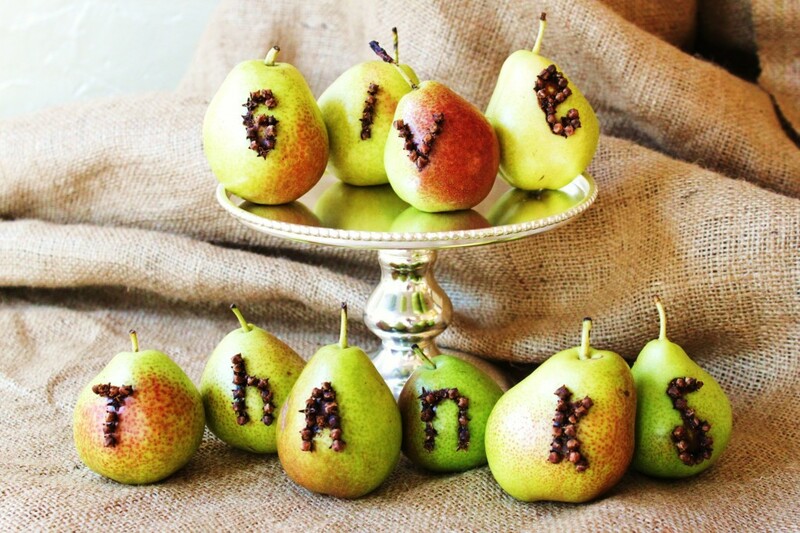 After you decide on the message that you want (welcome, give thanks, happy thanksgiving), carefully mark out the letters on the pears. 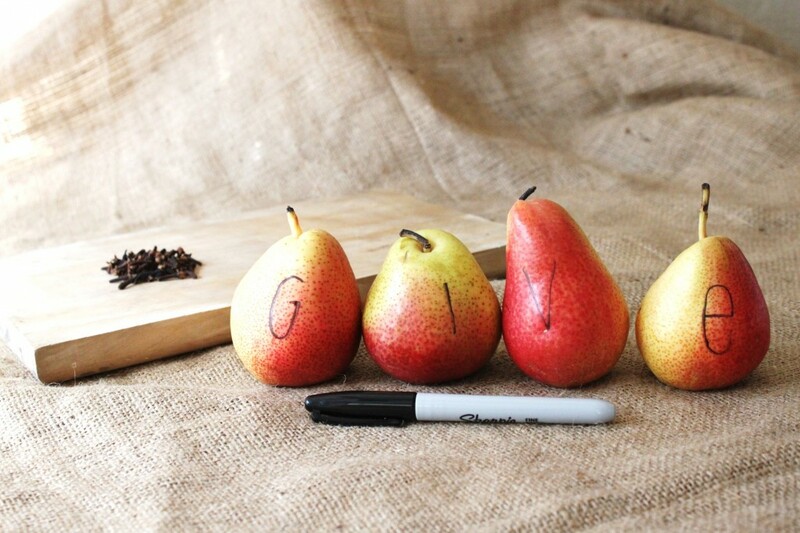 Take your cloves and push them in to the pears being sure to follow the marked out letter. Word to the wise – don’t do these too far in advance. They only last for about 2 days before the bruising around the outside of the letters starts to show. I would do these the day before Thanksgiving. Viola! Ready to go. You could do ones that say ‘welcome’ and place them on a table in the foyer. There is no end to these little guys’ versatility. 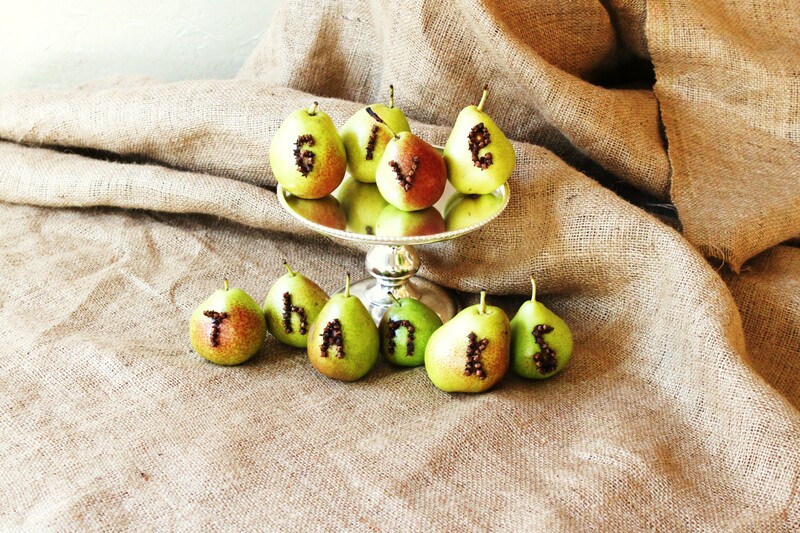 I hope you enjoy making this fun and super easy Thanksgiving decoration. thanks giving, love this idea! SO cute! !This sounds absolutely delicious!